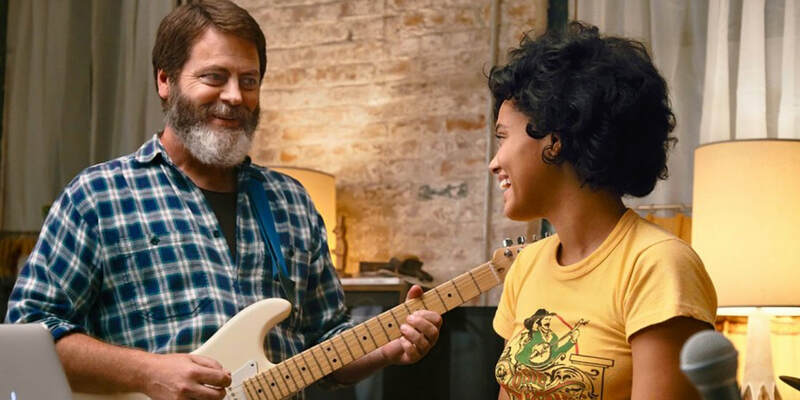 ​​​​​Frank Fisher, played with perfect defunct charm by Nick Offerman (“Parks and Recreation” & “The Founder”), is a single dad on the precipice of two major life events: his only daughter leaving for college and his record store closing. Disappointed that his passion for music has not been enough to sustain the profitability of his investment, he is drawn to an opportunity to make music with his talented daughter, Sam, played by Keirsey Clemons (“Dope”). As Sam is preparing for college and dealing with her own self-discovery, including a romantic relationship with Rose played by Sasha Lane (“American Honey” & "The Miseducation Of Cameron Post"), she is highly resistant to participate. But Frank is persistent as he hears a partial original work from Sam and adds his own talents to help round out his daughter’s creation. As they both continue through the summer preparing for the imminent reality of their separation, Frank begins to chase the burgeoning seeds of a connection he is feeling towards his landlord (Toni Collete) while also struggling with the care of his aging mother (Played by Blythe Danner) and relenting to the truth that he will most likely be a bartender, working for his friend, who just so happens to be played, ironically, by Ted Danson. It is apparent that Frank has worked hard to infuse his daughter with an appreciation for culture and his love for music. This has shaped who she has become since the loss of her mother, the details of which are uncovered throughout the film. Her talents for singing and creating is a result of these efforts. As a trade-off in the relationship, it is Sam who is more concerned with how the bills will be paid and he shows responsibility in the places that her father is lacking. It is Frank who catches her working on an original piece and sees the value in her collaboration. Much to Sam's dismay, their collaboration finds its way to Spotify success, and they are titled in the spirit of her vocalized objection as “We Are Not a Band." The film is very “now” and many will relate to this former musician, turned record store owner, working to adapt to the changes in his world and accept his own mortality. The music in the film is a highlight and it contains four original songs from composer-songwriter Keegan DeWitt and both of our lead performers sing on the film. It pays off, particularly in the third act when the film ends on a very inspiring and heartwarming note. Brett Haley (“The Hero” & “I’ll See You in My Dreams”) both wrote and directed the film and successfully maximizes the talent he is working with. Keirsey Clemons does an amazing job capturing her teenage angst and desire to separate from her father, pleasantly balanced with her discovery of what really matters. Nick Offerman offers his dry sensibility that we have come to know, but successfully shows us a vulnerable side that feels fresh. The tone is an ideal balance of heart, stakes, and humor that leaves the audience feeling satisfied and inspired. The film incorporates important themes of inclusion around sexuality and multiracial relationships with ease and comfort that I appreciated. There could be some complaints about the finale of the film having some elements of triteness. Frank’s potential relationship with Toni Collette and his struggles with his shoplifting mother are filler for the story that really has the father-daughter relationship at its center. I had the opportunity to view this film at Sundance, and despite some slight misgivings, this independent film is a true delight, well worth seeking out. It was one of my most rewarding viewing experiences because it is as joyful and hopeful as the setup sounds with terrific music which will always bring back fond memories of the film for me. The film was acquired, prior to Sundance by Sony and is expected for wide release later this year.